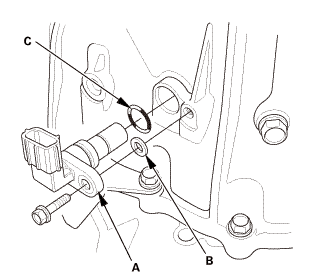 Remove the interlock bolt (A). 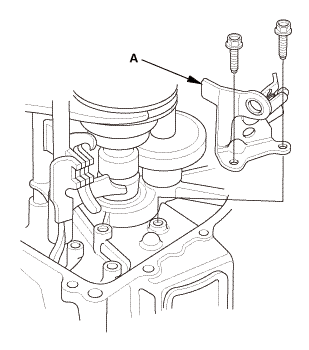 Remove any old liquid gasket from the interlock bolt. 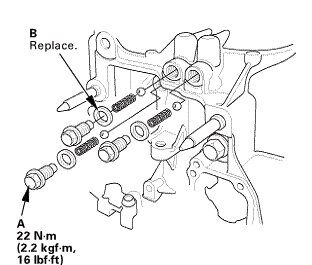 Remove the change lever assembly (B). Remove the 8 x 14 mm dowel pins (C). Remove the back-up light switch (A). Remove any old liquid gasket. 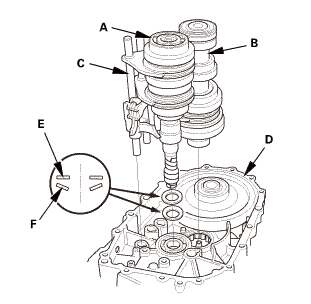 Remove the output shaft (countershaft) speed sensor (A), the plain washer (B), and the O-ring (C). 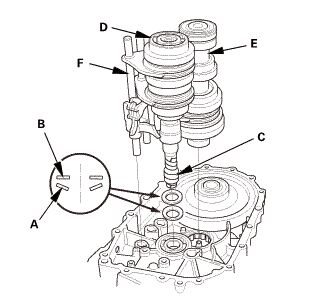 Remove the detent bolts (A), the 12 mm sealing washers (B), the detent ball springs (C), and the steel balls (D). 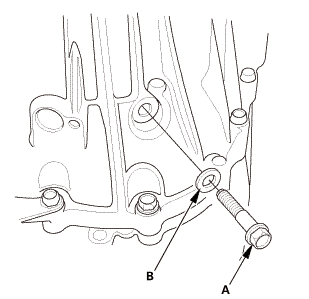 Remove the 10 mm flange bolt (A) and the sealing washer (B). 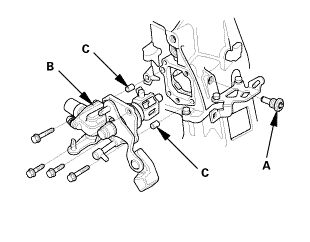 Loosen the 8 mm flange bolts in a crisscross pattern in several steps, then remove them with transmission hanger A, transmission hanger B, and the harness bracket (C). Remove the 32 mm sealing cap (A). While expanding the 72 mm snap ring (B) on the countershaft ball bearing with snap ring pliers, lift the transmission housing (C). Release the snap ring pliers, and remove the transmission housing. Remove the 14 x 20 mm dowel pins (D). Remove the reverse shift fork (A). 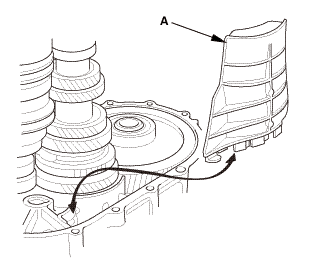 Remove the baffle plate (A). 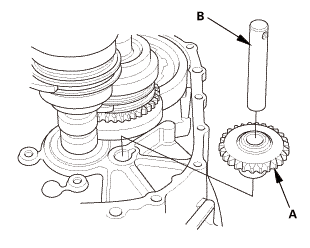 Remove the reverse idler gear (A) and the reverse idler gear shaft (B). Apply a thin layer of tape to the mainshaft splines to protect the seal. NOTE: Do not apply too much tape as it will damage the oil seal. 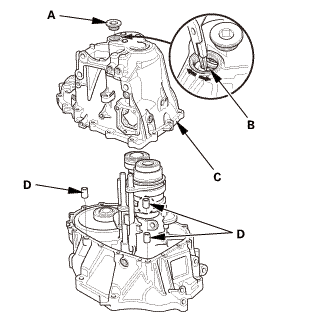 Remove the mainshaft assembly (A) and the countershaft assembly (B) with the shift fork assembly (C) from the clutch housing (D). Remove the 28 mm washer (E). 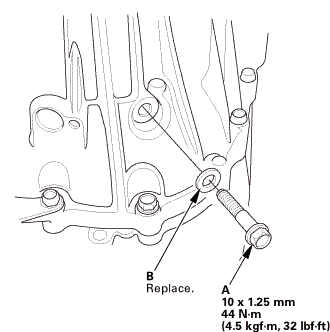 Remove the 28 mm spring washer (F). Loosen the bolts in a crisscross pattern in several steps. 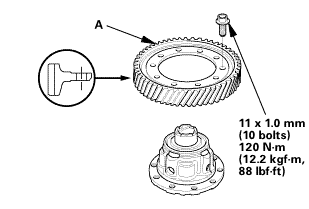 Remove the bolts and the final driven gear (A) from the differential carrier (B). Install the final driven gear (A) with the chamfer on the inside diameter facing the carrier. Tighten the bolts in a crisscross pattern in several steps. NOTE: Clean the magnet any time the transmission is disassembled. 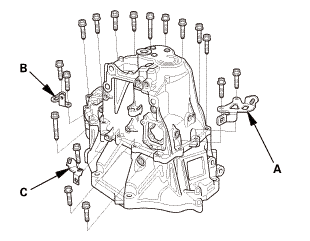 Install the differential assembly (B). Install the 28 mm spring washer (A). NOTE: Be sure to install the spring washer in the direction shown. 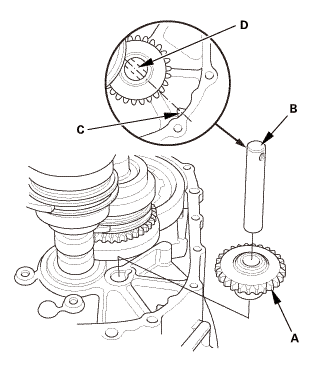 Install the 28 mm washer (B). Apply a thin layer of tape to the mainshaft splines (C) to protect the seal. 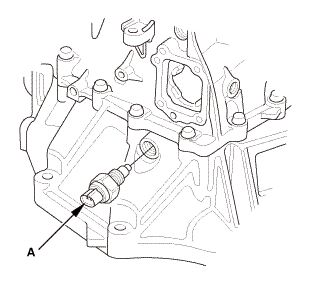 Install the mainshaft assembly (D) and the countershaft assembly (E) with the shift fork assembly (F), as an assembly. 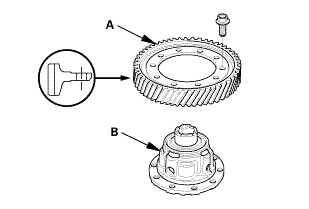 Install the reverse idler gear (A) and reverse idler gear shaft (B) by aligning the mark (C) on the clutch housing with the reverse idler gear shaft hole (D). Install the baffle plate (A). Install the reverse shift fork (A). 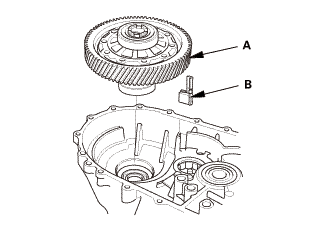 Clean any dirt or oil from the mating surface of the transmission housing and the clutch housing. Apply liquid gasket, P/N 08717-0004, 08718-0001, 08718-0003, 08718-0004, or 08718-0009 evenly to the clutch housing mating surface of the transmission housing. Install the component within 5 minutes of applying the liquid gasket. 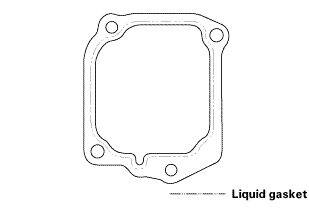 If you apply liquid gasket P/N 08718-0012, the component must be installed within 4 minutes. Install the 14 x 20 mm dowel pins (A). 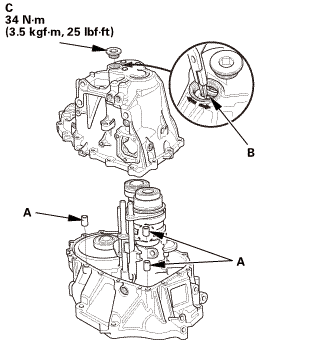 Place the transmission housing on the clutch housing, making sure to line up the shafts. While expanding the 72 mm snap ring (B) on the countershaft ball bearing using snap ring pliers, push the transmission housing down to start the countershaft ball bearing through the snap ring. Release the pliers, and push down the housing until it bottoms out and the snap ring snaps in place in the countershaft ball bearing snap ring groove. NOTE: Install the 32 mm sealing cap (C) after setting in the 72 mm snap ring. Make sure the 72 mm snap ring (A) is securely seated in the groove of the countershaft bearing. Apply liquid gasket, P/N 08717-0004, 08718-0001, 08718-0003, 08718-0004, or 08718-0009 evenly to the threads of the 32 mm sealing cap. Install the component within 5 minutes of applying the liquid gasket. 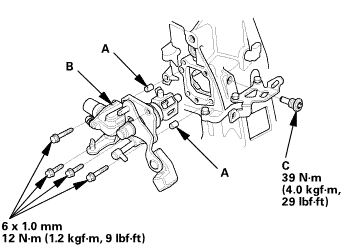 Install the 8 mm flange bolts finger-tight with transmission hanger A, transmission hanger B, and the harness bracket (C). Tighten the 8 mm flange bolts in a crisscross pattern in several steps. Install the 10 mm flange bolt (A) with new sealing washer (B). Install the steel balls, the detent ball springs, and the detent bolts (A) with new 12 mm sealing washers (B). 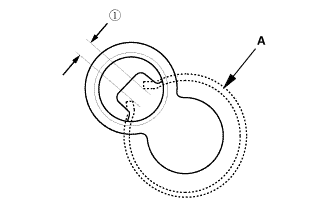 Apply MTF to a new O-ring (A). 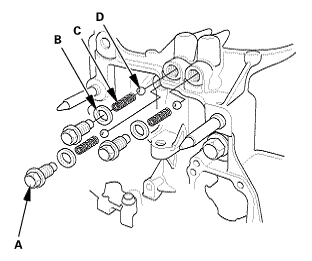 Install the output shaft (countershaft) speed sensor (B) with the O-ring and the plain washer (C). 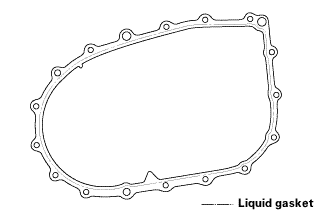 Apply liquid gasket (P/N 08717-0004, 08718-0001, 08718-0012, 08718-0003, 08718-0004, or 08718-0009) to the threads of the back-up light switch (A). Install the back-up light switch. 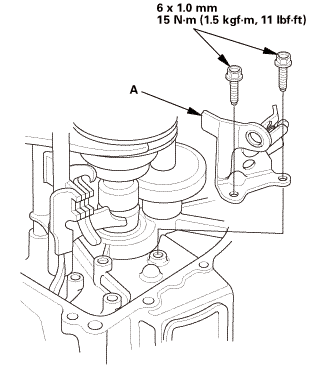 Clean any dirt or oil from the mating surface of the change lever assembly and the transmission housing. 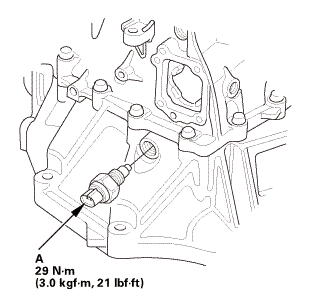 Apply liquid gasket, P/N 08717-0004, 08718-0001, 08718-0003, 08718-0004, or 08718-0009 evenly to the transmission housing mating surface of the change lever assembly. Install the component within 5 minutes of applying the liquid gasket. Install the 8 x 14 mm dowel pins (A). 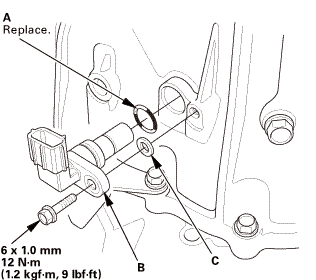 Install the change lever assembly (B). 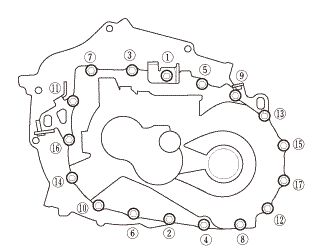 Apply liquid gasket (P/N 08717-0004, 08718-0001, 08718-0012, 08718-0003, 08718-0004, or 08718-0009) to the threads of the interlock bolt (C).